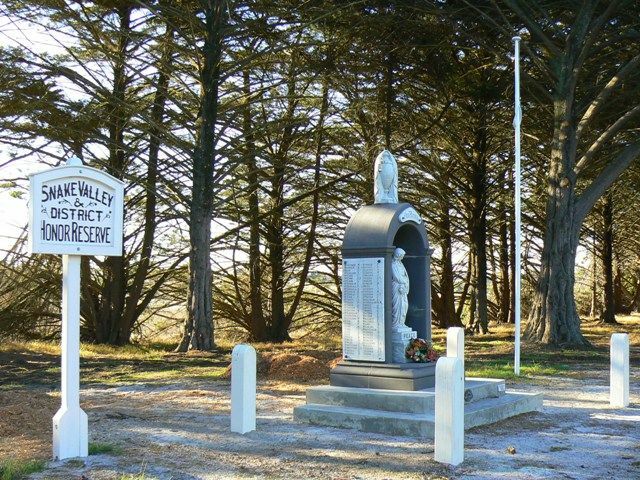 The Snake Valley Avenue of Honour also known as the Snake Valley Honour Reserve was planted in memory of the soldiers who served in World War One. Crs. Carstairs, Lewis and Roddis met the committee of the avenue of honor on Saturday last, and a tour of inspectionwas made to the site. Slight alterations were effected, and various proposals will be dealt with at a public meeting to take place on Saturday next. The avenue is in the main street on the Snake Valley and Carngham roads, with a length of a quarter of a mile and a depth of 77 feet. Provision will be made for 150 trees. The kind chosen will probably be golden cypress. The Ripon Shire Council has six men employed preparing the site. Riponshire Advocate (Vic), 29 June 1918. On Monday, in the newly-formed Honor Reserve, where 146 golden cypress trees were planted in memory of Snake Valley and district soldiers, about 50 wattles were planted by the local school senior boys and girls. Grenville Standard (Vic), 10 August 1918. Note: The life span of the wattles was intended for only 10 years, until the cypress trees matured.